In the creeks of Nigeria’s Niger Delta, home to the world’s third largest wetland, more than two million barrels of crude oil are pumped and exported daily, but an estimated 30,000 to 300,000 barrels are also stolen. The Niger Delta is home to about 31 million people, belonging to 40 different ethnic groups, bound by fishing, farming and hunting. Since 1958 however, the people of the Niger Delta have also been bound by the misery of crude oil exploration. Farmlands have been destroyed and water ways overtaken by thick slicks of crude oil. Amnesty International estimates that nine million barrels of crude oil has been spilled in the region since the first oil well was dug. The degradation of the Niger Delta environment was revealed in a 2011 study by the United Nation Environmental Programme (UNEP). Surface water throughout the Niger Delta creeks contain hydrocarbons with floating layers of crude oil varying from thick black oil to thin sheets, according to the UNEP study. It cites community actually drinking water from a well that is contaminated with benzene, “a known carcinogen, at levels 900 times above the World Health Organisation (WHO) guidelines. Life in the Niger Delta is no longer the same. Forced out of their traditional way of life, the people of the Niger Delta have found a new way to survive. Under the cover of darkness, in the midst of the forests, a trade is booming. Wooden Canoes once used for fishing have become transport vehicles for barrels of stolen crude oil. Crisscrossing the wetlands of the Niger Delta are long pipelines carrying millions of barrels of crude oil. These pipelines tap into a fraction of the 34 billion in proven crude oil reserves in the Niger Delta. The region also holds another 186 trillion cubic feet of gas reserves, the eight largest in the world. The exposed pipelines are the source of stolen crude oil. A copy of a report obtained by this reporter, describes how crude oil is stolen from the exposed pipelines. Hacksaws are used to damage to pipelines. This forces the oil company to shut down oil flow on the affected pipeline to reduce the impact of any oil spill on the environment. As soon as this is done, the oil thieves install bunkering points on the hacked portion of the exposed pipes and attach hoses and suction instruments to the pipes. As soon as oil starts flowing on the pipelines again, they siphon the flowing crude to waiting locally made barges; said to be able to store up to 40,000 barrels of crude oil at a time and large canoes called “Cotonu boats”. The oil thieves have two markets for their stolen oil, the local refineries in the creeks and offshore large tankers waiting patiently for such cargoes. The report confirms that the portion that is sold to the local refineries in the creeks is refined into diesel, transferred to a storage depot and then sold in the local Nigerian market. A local journalist familiar with the Niger Delta says the stolen and locally refined diesel is sold at about N150 (59 pence) per litre compared to the official price of N190 (75 pence) per litre for the imported none locally refined diesel. Corrupt security agents are behind the trade, he says, explaining how large barges of stolen crude oil are able to move around the creeks unchallenged. The exact number of barrels of crude oil stolen is not certain. But various reports put it between 30,000 to 300,000 barrels of crude oil every day. Ian Craig, Shell’s director for Sub Saharan Africa told an oil and gas conference in Abuja in December 2011 that Nigeria could be losing as much as 150,000 barrels of crude oil a day to the oil thieves. A special report by the United States Institute of Peace (USIP) titled “Blood Oil in the Niger Delta” estimates that the loss to the Nigerian economy from stolen crude oil between 2003 to 2008 could be as high as $100 billion. Despite the significant loss of revenue to the Nigerian state, the government seem reluctant to deal with the massive theft of crude oil taking place in the creeks. "If the president goes after them, they could destabilise the country, cause a coup, a civil war. They are that powerful, they could bring the state down." Toyin Akinosho, a previous employee of Chevron and publisher of “Nigeria Oil and Gas” confirmed the fears expressed by the BBC source in a phone chat with this reporter. Nigeria earns 90% of its revenues from crude oil exports. So blowing up the pipelines could collapse the government. But the inability of the government to deal with the situation could also be traced to top level political involvement in the oil theft trade. Top level involvement in the stolen crude oil business may explain how in 2004 a detained Russian Ship carrying an estimated $2.6 million in stolen crude oil vanished. The Nigerian Navy detained the ship and claimed they handed it over to the Nigerian police. The Nigerian police claimed that they never received any ship from the Navy. The Nigerian legislature launched an investigation into the missing the ship. The report of the investigation was never made public. Since then, several more ship detainments have been reported in the media. In 2011, security agencies are said to have arrested 145 people and seized among others 18 tankers, 22 vehicles, 16 barges, and 35 locally made boats. Sources familiar with the stolen crude oil trade however say these arrests target just the foot soldiers fronting for local and international financiers. There is evidence of well-established international syndicates facilitating the stolen crude oil trade in Nigeria. 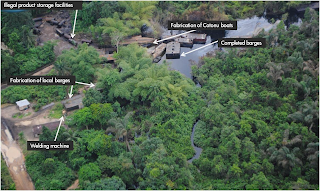 The route to the international markets for Nigeria’s stolen crude oil is a collaborative effort between the foot soldiers in the creeks, the communities hosting the oil wells and pipelines, the Nigerian Navy and security agencies, and an international syndicate of oil thieves that finance the whole process. The international syndicate involves well established players in markets for stolen Nigeria crude oil in West African countries like Sao Tome, Liberia, Senegal, Cote d’Ivoir, Gambia supported by Moroccan, Venezuelan, Lebanese, French and Dutch Financiers. The stolen oil is usually exchanged for cash, illegal drugs and weapons from the ships lurking out at seas waiting for the stolen oil to be delivered. The large tankers that buy the stolen crude oil take them directly to spot markets like Rotterdam or directly to refineries in places like Cote d’Ivoire a neighbouring West African country. “There are large international syndicates involved in this operation, which also handle the money laundry for the international players” according to the USIP report mentioned earlier. The report notes that the players in the creeks are just the front end of a complex international trade in stolen crude oil. “While the Niger Delta youth may handle the local tapping and loading, international players from Eastern Europe, Russia, Australia, Lebanon, The Netherlands and France all play roles in financing, transporting, and laundering the money associated with blood oil. One money trail followed a path from Senegal and Cote d’Ivoir, through French banks and French credit agencies to Syria and Lebanon.” The USIP report revealed. Attah, Shell’s Vice President says only international collaboration can stop the booming trade in stolen crude oil from Nigeria. The Nigerian state may be too compromised to stop the massive oil theft taking place, unless as Attah suggests, the international community intervenes.